This simple, once daily supplement, makes it easy to remember and easy to support a healthy lifestyle. 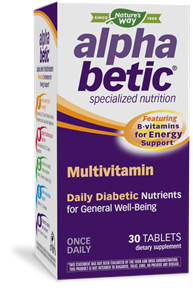 It can be used alone or with other alpha betic® supplements. For adults & children 12 years of age and older, take 1 tablet daily in the morning. Caution: People with diabetes should regularly monitor blood glucose levels. If you are pregnant, nursing or taking medication, consult a healthcare professional before using this product.